William of Mass Destruction: Excitement. Guess what's happened at our house? We have leaves on our tree! I made Mom get out the Crayolas to celebrate, and look! A color just for the occasion! Concatulations! Does this mean open windows? Whiffies?? 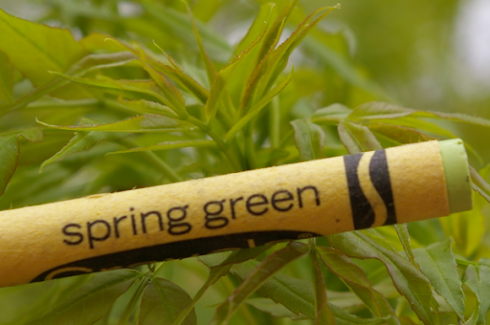 Wow, that crayon is a perfect match to your spring leaves. Spring Green. We are moving well into autumn now, but we have green all year on most trees. Olive green. Well, there’s not much spring green around here. In fact, we may get some winter white tonight. Pfffbbbt. You know we got snow the other day. Spring green, I wish! That's awesome! 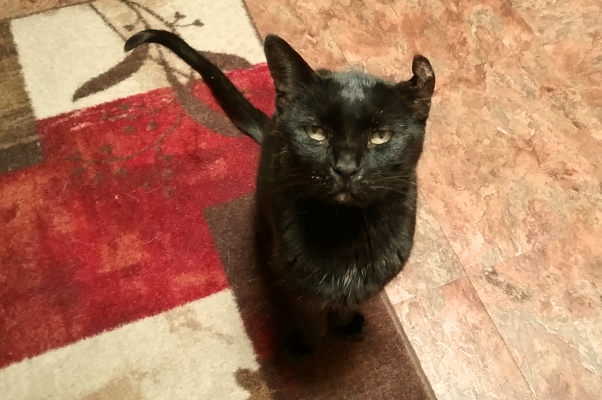 The crayon is even the right color (my human has noticed that no matter what the name says, sometimes the actual crayon color isn't what's described). Hooray, that's a good sign indeed! YEA YEA!!! I have some too, guys! We don't know what the words 'spring' or 'green' mean anymore, Elliott. We only know white or grey. Please send some of that spring up to Pennsylvania, because here it's still cold and damp. we are so jealous! Not a leaf in sight here and minus 13 celcius! That is exciting to know that Spring is actually trying to arrive. We have green here too!